THURSDAY, 29 SEPTEMBER – The Organising Committee Members of the programme ‘Seerat Salam’ recently held “Night of a Thousand Stars” with the new intake of Residential College, Kolej E, Universiti Malaysia Sabah (UMS) 2016. Themed, P. Ramlee Appreciation Night, the highlight of the Seerat Salam programme was a platform to strengthen camaraderie between residents of Kolej E and the principal committee of the college. 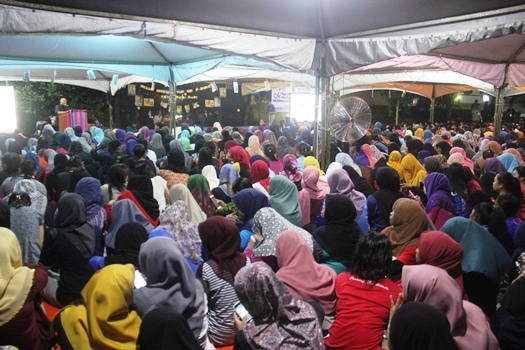 According to a statement issued by the Kolej E, the exposure given throughout the programme had been beneficial for all residents of the college. The programme was officiated by the Head of Student Affairs Department, Azmi Jumat. The event also included reenactments of films produced by Tan Sri P. Ramlee, presented by every residential college block.